The company’s interest has developed along with an increasing awareness and appreciation by architects and clients of the art of decoration. Mulholland Restorations’ conservation program maintains an on-going training and educational program to ensure the companys position is acknowledged as the most capable and experienced in preserving and protecting heritage buildings with painted surfaces and historical decoration. Our hand skills are collectively the best available. The removal of layers of over-paint to reveal a previous decorative scheme can be sensitive work. Removing over-paint from an intact design requires material knowledge and great care. 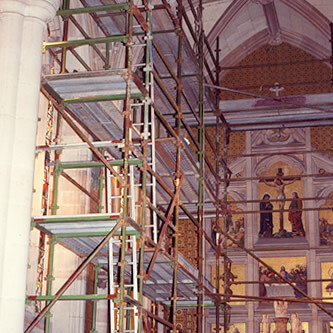 Our company can provide these services including recording and documenting, stabilizing, repairs and in-painting with materials designed to accurately replicate or match the traditional paint characteristics, texturing requirements and scagliola repairs. If it comes within the ‘paint field’, we can do it. Distinguished projects which have been proudly undertaken and successfully accomplished include the painting and re-instatement of the 1901 decorative scheme in the Great Hall in the Royal Exhibition Building, conservation and repair of the 100-year-old stencils and the interior re-decoration of St. Patricks Cathedral, conservation and restoration of the Regent Theatre.